An original letter of correspondence between Joshua Coffin Chase and his nephew, Randall Chase. Topics discussed in the letter include enclosed copies of letters regarding Isleworth packinghouse Superintendent Corbett Hutchinson's upcoming business trip to New York City, New York, and Washington, D.C. 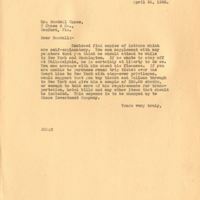 Original letter from Joshua Coffin Chase to Randall Chase, April 26, 1928: box 49, folder 20.91, Chase Collection (MS 14), Special and Area Studies Collections, George A. Smathers Libraries, University of Florida, Gainesville, Florida. Digital reproduction of original letter from Joshua Coffin Chase to Randall Chase, April 26, 1928. Enclosed find copies of letters which are self-explanatory. You can supplement with any pointers that you think he should attend to while in New York and Washington. If he wants to stop off at Philadelphia, he is certainly at liberty to do so. You can arrange with him about his finances. If you are unable to purchase round trip ticket over the Coast Line to New York with stop-over privileges, would suggest that you buy ticket and Pullman through to New York and give him a couple of $50.00 checks, or enough to take care of his requirements for transportation, hotel bills and any other items that should be included. This expense is to be charged up to Chase Investment Company. Chase, Joshua Coffin. 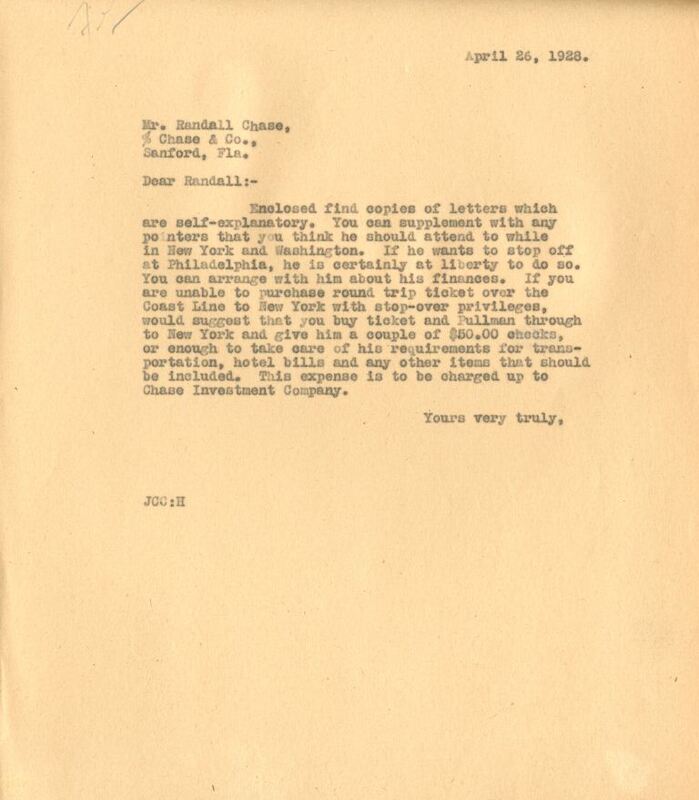 “Letter from Joshua Coffin Chase to Randall Chase (April 26, 1928).” RICHES of Central Florida accessed April 24, 2019, https://richesmi.cah.ucf.edu/omeka/items/show/2778.